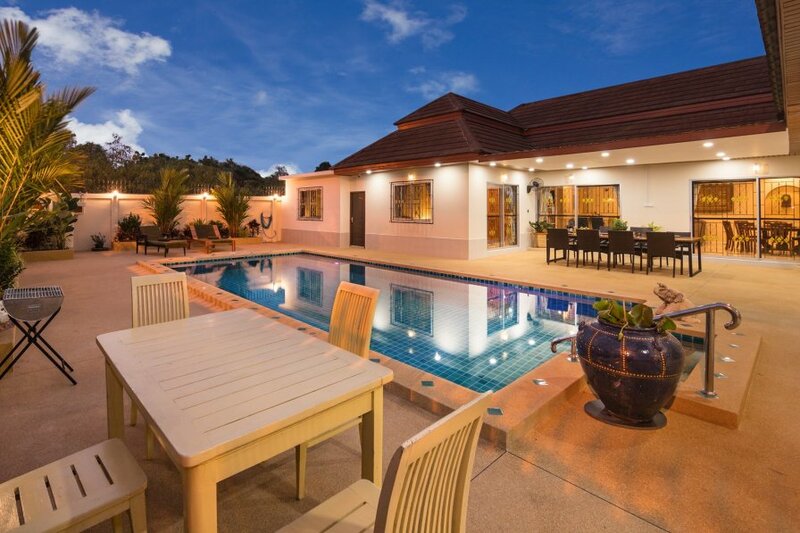 Villa Bos with private pool just 5 minutes drive from the beach in Jomtien. The Villa is situated close to the beach, just 5 min drive, he Villa is Free standing without any neighbors. The house has a private swimming pool from 8 x 5 meters, with terraces to stay in the shadow or to enjoy the nice warm sun from Pattaya. The place is tastefully decorated and has a large living room with all the luxury that you can expect from a villa, TV, wifi, great furniture and a modern kitchen. On the sealing are fans for a cool breeze during the warm days. The Villa has 5 bedrooms and 5 bathrooms; all bedrooms are air-conditioned for a nice cool sleep. The kitchen is fully equipped with a big refrigerator, freezer, water cooker, rice cooker, toaster, coffee machine and a microwave. Outside terrace with shaded seatings and BBQ area; the terrace has direct access to the fabulous pool. For the best nightlife have a look at the Famous Walking Street and Soi LK Metro just a few minutes away from the Villa.